Paneer matar stuffed paratha recipe - Paratha, chapathi, and roti are our staple food. The whole process of making this paratha is easy and very simple to prepare in the comfort of the kitchen. For stuffing, mix green peas coarse paste, grated paneer and mild spice powder. The stuffing technique is very simple. Just roll the poori sized roti and place the filling, then join the edges and roll into thin paratha. Shallow fry it on a griddle using ghee. An amazing paneer matar paratha will be ready within few minutes. 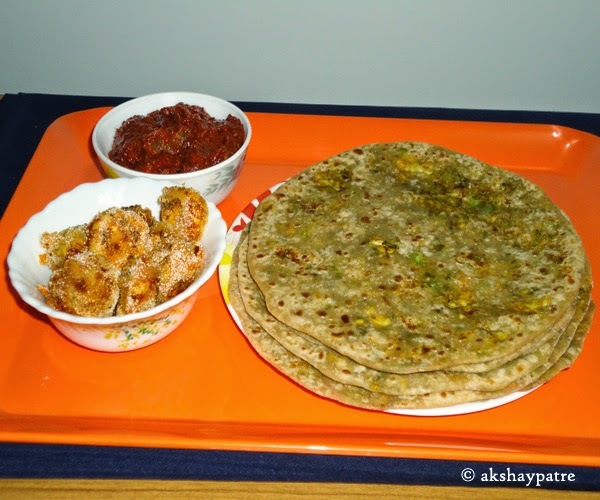 Serving hot parathas with favorite side dish is really an enjoyable task. The paratha itself is a full meal and it can also be carried in the lunch box. Even hot paratha with a dollop of ghee tastes awesome. These parathas were soft and flavorful with the addition of paneer and spice powder. Wash the green peas and drain water. Put them in a mixer jar and grind to a slightly coarse paste without adding any water. Grind in 2 - 3 batches. Transfer the matar paste into a bowl and set aside. Heat 2 teaspoon of oil in a frying pan and add hing to it. Saute till aromatic. Add coriander seeds powder, cumin seeds powder, garam masala powder, turmeric powder and chilli powder. Saute for 2 minutes. Add the green peas paste and ginger paste. Saute for 3 minutes. Cook covered on low flame till the green peas become soft. Do not add water. Once the green peas become soft, add the grated paneer and salt. Saute on low flame for 5 minutes. Add the chopped cilantro and mix well. Remove the pan from heat and keep it aside. Allow it cool. After 20 minutes, take a lemon sized dough portion, dust with wheat flour and roll out a thin poori sized roti. Place 2 tablespoon of filling on the roti. Lift the edges to make a modak shaped ball. Twist the tip and dust it with wheat flour. Roll out to a thin paratha. Heat a griddle and apply some ghee on it. place the rolled paratha. Pour 1/4 tsp ghee or oil around the paratha and shallow fry till golden colour from both sides. Apply some ghee on both sides. Serve hot with choice of your side dish. 1. Wash the green peas and drain water. Put them in a mixer jar and grind to a slightly coarse paste without adding any water. Grind in 2 - 3 batches. 2. Transfer the matar paste into a bowl and set aside. Heat 2 teaspoon of oil in a frying pan and add hing to it. Saute till aromatic. Add coriander seeds powder, cumin seeds powder, garam masala powder, turmeric powder and chilli powder. Saute for 2 minutes. 3. Add the green peas paste and ginger paste. Saute for 3 minutes. Cook covered on low flame till the green peas become soft. Do not add water. 4. Once the green peas become soft, add the grated paneer and salt. 5. Saute on low flame for 5 minutes. 6. Add the chopped cilantro and mix well. Remove the pan from heat and keep it aside. Allow it cool. 7. In the meantime, Sieve together the maida and wheat flour. Add salt and water as required and knead it to a stretchable smooth and soft dough and keep it aside for 20 minutes. 8. After 20 minutes, take a lemon sized dough portion, dust with wheat flour and roll out a thin poori sized roti. Place 2 tablespoon of filling on the roti. 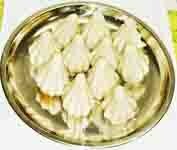 Lift the edges as shown in the picture below and give it to a modak shape. 9. Twist the tip and dust it with wheat flour. Roll out to a thin paratha. 10. Heat a griddle and apply some ghee on it. place the rolled paratha. Pour 1/4 tsp ghee or oil around the paratha and shallow fry till golden colour from both sides. 11. Apply some ghee on both sides. Serve hot with choice of your side dish. Love these stuffed paratha's anytime!!! So yummy! 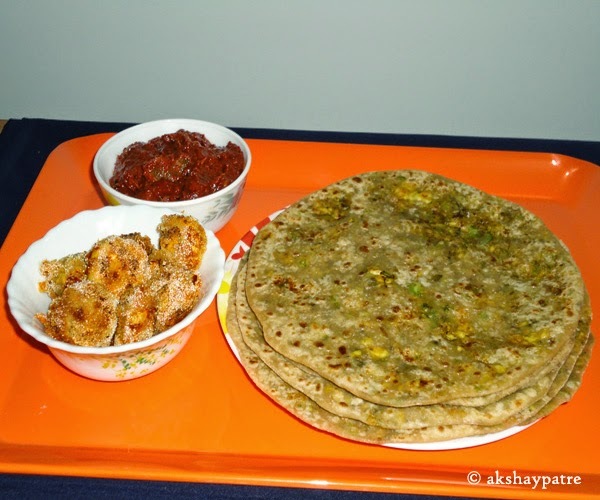 I am a big fan of stuffed paratha , mutter and paneer paratha looks scrumptious and perfectly made dear !! Delicious matar paneer parathas, looks inviting. Super healthy paratha to enjoy fr dinner ..nice pics too.